I guess some romances aren’t meant to last forever! Who knew??? It seems that Macaulay Culkin and Mila Kunis actually ended their relationship months ago, but kept it quiet. An insider recently told In Touch Weekly that the pair hit a rough patch because of Kunis’s skyrocketing career and the fact that she lives in L.A., while Culkin is based in New York. …an idea so smart my head would explode if I even began to know what I was talking about! Mmmmmm. I’ve always loved Papa John’s pizza. Now that I’ve become a fan on their Facebook site, it appears that I’ll be receiving a coupon for free pizza! Thanks guys! Between 3 p.m. and 10 p.m. Monday, Papa John’s group went from around 10,000 users to nearly 124,000. That’s gonna cost it a lot of dough. The deal, which will be sent out via the group’s updates starting Wednesday and requires the purchase of another pizza, ends December 1. The Pizza Wars are really heating up. Most of the big pie spinners now allow you to order on their sites, through widgets, or via text messaging. I find it more pleasurable to order Domino’s by its website than to actually eat the stuff. Watching that little status bar teasingly track your pie’s progress in the minutes before your doorbell rings is a lot saucier than the food. But now the biggies are spreading their pepperoni though major social networking sites and more unconventional means. Last month, Pizza Hut began allowing customers to order using Facebook and immediately transgressed by notifying all the friends in their groups that they had done it. Apparently that was a spam too far, because the company apologized and relented. The Hut moved on to bribing online customers with free music downloads. Domino’s just enabled ordering by TiVo. All of us on Facebook and MySpace have been tracked by from people we’d rather not hear from again. But people get socially greedy. Long-lost contacts notice that their Friend count could use a goose, and suddenly everything’s bygones. Papa John’s takes it a step farther, though. It’s so eager to boost its friends list that it’s going out of pocket to elevate the number. Like Paris Hilton, it’s paying for friends. I never thought of that. I wish I’d held out on those jerky former high school jocks for a little gratuity before accepting. A tragic subculture in our country rarely receives the media attention it needs and deserves. The group I allude to, of course, is the underweight nerd. The Simpsons has Comic Book Guy, Family Guy has Peter Griffin, even The Nutty Professor has Sherman Klump. The skinny guys have…Steven Q. Urkel. Why should all the overweight nerds get all the spotlight? Facebook and Papa John’s pizza are finally teaming up to give the little dudes a little help in their quest to be weightier. Any Facebook user who becomes a fan of Papa John’s will automatically receive an e-coupon good for one free medium-size pizza with any online pizza order. The offer expires December 1, so be sure to plan your pig-out soon. 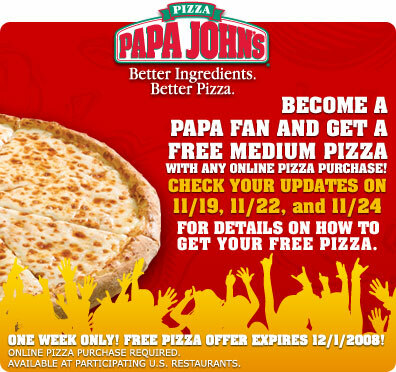 Are these pizza promotions the start of a trend? Seth MacFarlane, creator of TV’s “Family Guy,” will debut “Seth MacFarlane’s Cavalcade of Cartoon Comedy,” an animated series set to be distributed exclusively through Google using the AdSense advertising system. MacFarlane has created three animated Burger King advertisements that will play ahead of the new series’ clips. Next month, Seth MacFarlane, creator of the “Family Guy” TV series, will unveil a high-profile new project called “Seth MacFarlane’s Cavalcade of Cartoon Comedy,” an animated variety show that will be distributed solely through Google. The Internet giant will syndicate the new program using its AdSense advertising system to thousands of Web sites that are predetermined to be gathering spots for MacFarlane’s target audience, typically young men. Instead of placing a static ad on a Web page, Google will place a “Cavalcade” video clip. YouTube will also devote a channel to the material. Marketing messages will be incorporated into the clips largely through “preroll” ads, but Burger King took its involvement a step further. In a rare example of one of Hollywood’s top creative powers working hand-in-glove with a marketer, MacFarlane created and animated Burger King ads to play ahead of “Cavalcade” clips. If Seth MacFarlane is involved, this should be good. I have always been a fan of the “Family Guy” television series which includes humor which pokes fun at just about everyone. I’ll be looking forward to seeing the clips online soon. Thoughts?